Enhance the efficiency of your firebox with this Empire FBB5 Automatic Single-Speed Blower. Compatible with all Breckenridge models. We will not show any measurements for the blowers we offer. Fireplace blowers and doors, etc., are listed accessories for fireplaces we also offer. The correct blower to use should be shown in the product literature included with your hearth system and this is the only blower that should be used. Can this be used with the Empire Vail VFP-36-PP32EP? Yes that is the blower for the vail. 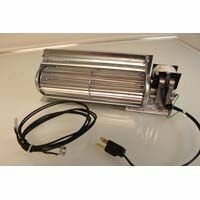 Will this blower work in the empire breckenridge flush vfd36fbof unit? Yes, the FBB5 may be used with the flush faced version of this firebox. How many CFM's is this fireplace blower rated at? Per the manufacturer, this model is rated at 130 CFM. Can this blower be hard wired? It is indeed possible to hard wire this blower. Typically, the unit is just plugged in for ease of removal. However, the factory installed plug can be removed if desired. The product is very easy to install (it simply has magnets on the bottom and back panels) so it is just placed in the firebox. It has plenty of air power to circulate the warm air up the back of the firebox and out the top vent. My only complaint is the power cord is not very long - only about 1 foot long. I had to order a 1' extension cord to reach the outlet in the firebox. ConsOne speed and can't turn it off because it is controled by thermostat. This is the absolute best company to buy from...internet or in-town. There is no dealing with or working with as you just go online, pick out your item, click and purchase and by the time you can shut the computer down, the delivery guy is knocking on your door. Honestly, it is amazing. I would recommend you to all my friends.